Eliezer Ben Yehuda was the man who fulfilled the Zephaniah 3:9 prophecy which reads, "In those days I will restore the peoples of pure language that they may call on the name of the Lord to serve Him with one accord." He was born in Lithuania in 1858 to an Orthodox Jewish family. He began studying, reading when he was just three years old. He was absolutely a genius. He excelled in all languages. He learned Hebrew very quickly. By the age of 12, he was already fluent in many languages like French, German and Russian. He was a spectacular language specialist. Ben Yehuda's family wanted him to be a rabbi, but that never was something that he seemed to be interested in. Instead, he decided to move to Paris and study medicine. He was there four years studying medicine. While he was in Paris, the spirit of nationalism began to sweep across Europe. This is the idea of one nation for every people. The Balkans, like every other group of people there, were wanting their own nation. That spirit of nationalism touched his heart and his soul and he decided the Jews really need a land for their own nation. This was before Theodore Herzl came on the scene. 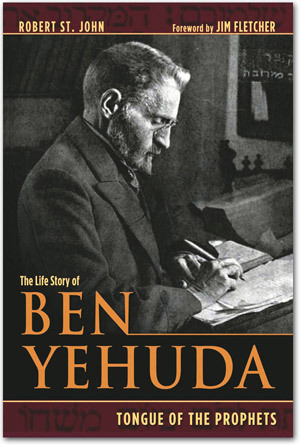 In fact, a number of years before Herzl who is considered the founder of modern day Israel came on the scene, Ben Yehuda had this vision of going back to the Jewish homeland and starting to speak Biblical Hebrew once again. Ben Yehuda believed it was essential if the Jewish people were really going to be a nation for them to have their own special language. To truly understand what this was all about, you have to understand that when the Jews were scattered by the Romans all over the world after 70 AD, that the Jewish people stopped speaking Hebrew. Those who went into the European area took Hebrew and they mixed it with German and came up with a new language called Yiddish. Likewise, the Jews who were scattered into the Mediterranean Basin took Hebrew and they mixed it with Spanish and came up with a language called Ladino. Jews continued to read Biblical Hebrew in the synagogue for example, or when they were reading the Talmud or various religious papers, but they stopped speaking Hebrew as an everyday language. They were speaking either Yiddish, Ladino, or the language of whatever country they happened to live in. So, Hebrew over the 2,000 years following the dispersion of the Jews all over the world became essential a dead language as far as being spoken by people on an everyday basis. In 1881, at the age of 23, Ben Yehuda was diagnosed with tuberculosis. He was told that he only had a very short time to live. So, he decided that he was going to move to the land of his people, to his homeland. If he was going to die young, he was going to die there. Well, that was about the worst decision one could make in 1881, because he moved to the Holy Land and to the City of Jerusalem. Jerusalem at that time was an incubator of disease. Just about every disease you could imagine was rampant in the city. People were dying of tuberculosis, cholera, yellow fever, and the plague. You name it! But, Jerusalem is where he came to live. And, God supernaturally extended this man's life even with TB for many, many years thereafter. When Ben Yehuda arrived in Jerusalem, he became obsessed with the revival of the Hebrew language. He would work 12-18 hours a day trying to revive the Hebrew language from the dead so it would become a daily spoken language of the people. "Whan that Aprile with his shoures soote. The droughte of March hath perced to the roote. And bathed every veyne en swich licour. Of which vertu engendred is the flour." If I told you that God had told me that we've got to go back and revive that language and bring it up to date, I suspect you would be calling the guys with the butterfly nets to have me put away as incurably insane. Well, let me tell you, there were many people who felt that way about Eliezer Ben Yehuda. He ended up with people attacking him from both sides. For example, the men who later became the major political leaders of Israel in its early years were all Socialists, and they were men who were mainly Agnostics and some were Atheists. They didn't want to speak a biblical language. They wanted a modern language. On the other hand, the ultra-orthodox were also opposed to Ben Yehuda because they believed that Hebrew was a biblical language that should never be spoken on the street. So, he had both sides attacking him all the time. And yet, this man was so obsessed and determined that he succeeded. In the third segment of this series that marvels at the revival of Biblical Hebrew coming back from the dead, we'll explore the systematic approach that Eliezer Ben Yehuda used in getting Biblical Hebrew accepted.